Cindy was born and raised in Southern Oklahoma where she grew up watching her dad dabble in oil painting, sculpture and furniture making, and has resided in Texas since 1990. She is the mother of two grown sons, Drew and Trey, and currently lives in North Texas with her husband, Gene, and their standard poodle, Jax. Although she wanted to major in art in college, she was steered toward a more consistently lucrative career and became a CPA. In 1993 she painted her first watercolor, but after only a few paintings, the paper, paint and brushes were soon put away in favor of work and family. 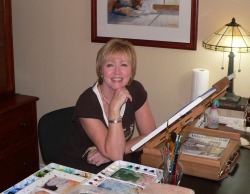 In the fall of 2008, she rediscovered watercolor and began to paint with a passion. Cindy has diligently studied and collected art technique books for most of her life. She has taken watercolor workshops with Charles Reid, Mary Whyte, Ted Nuttall, Paul Jackson, Fealing Lin and Ken Hosmer just to name a few. She greatly enjoys painting animals and portraits and accepts commissioned portraits from photographs. Contact her at cindydaunis@gmail.com if you are interested.